Yes, we are always a little "off", but we didn't mean that! We are off to Salt Lake City, Utah in the morning for training on the Handi Quilter quilting machines. Excited? You bet! We can't wait to learn all about these great machines. We have had so much interest and we know our heads will be spinning with information when we return. Be sure to watch our Facebook page as we will be posting all week! Due to training on the Handi Stitch conventional machines, we are going to have to change Garden Club to Thursday, September 15 and Friday, September 16. No, you aren't seeing the wrong dates. That Thursday and Friday are the only two dates that we can have Garden Club in September due to vacations and quilt shows. 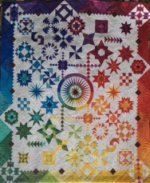 Speaking of quilt shows, have you marked your calendar for Gems of the Prairie Quilt Show at the Peoria Civic Center on Saturday, August 27th - 9 AM - 5 PM and Sunday, August 28th - 11 AM - 4 PM? The quilt pictured to your right is their raffle quilt. Isn't it scrumptious? They always have a beautiful display of quilts and we hear there are going to be some AWESOME vendors!!! Note this date is much earlier than their usual date.